C lassic or contemporary? It’s the eternal fashion dilemma. Sometimes you need the tried and tested, like amethyst, the purple gemstone with a long and storied history. Treasured by powerful women from Cleopatra to the Queen of England, amethyst is a classic gemstone that long ago earned its place in the upper echelon. Other times you desire the fresh, modern look of tanzanite, the bold new gemstone discovered when lightning struck the foothills of Mount Kilimanjaro and unearthed the violet-blue beauty hidden below the surface. There is no more contemporary or dramatic stone. But whoever said you had to choose? 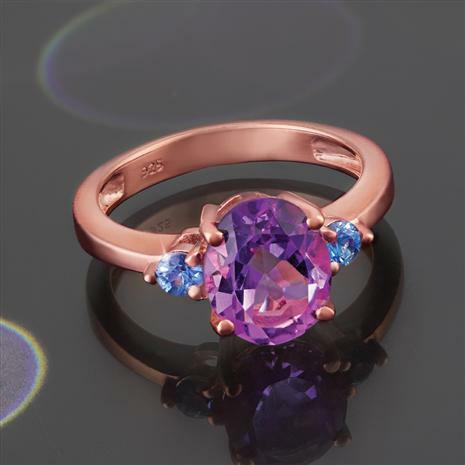 The Ultimate Amethyst and Tanzanite Ring combines the classic and contemporary into one perfectly balanced piece of jewelry with intense and inspiring colors. A 2 ½ carat purple amethyst sits powerfully in the center of a rose gold-finished sterling silver ring, flanked by two violet-blue tanzanite stones as bold as the lightning that so famously brought them to the world’s attention. After combining the classic and contemporary, we remembered to control the third and most important “C” — because we know it’s ultimately the cost that decides whether any item of jewelry is a good choice. We’ve kept the price down to $79, so we can truly say that this ring is the ultimate choice.